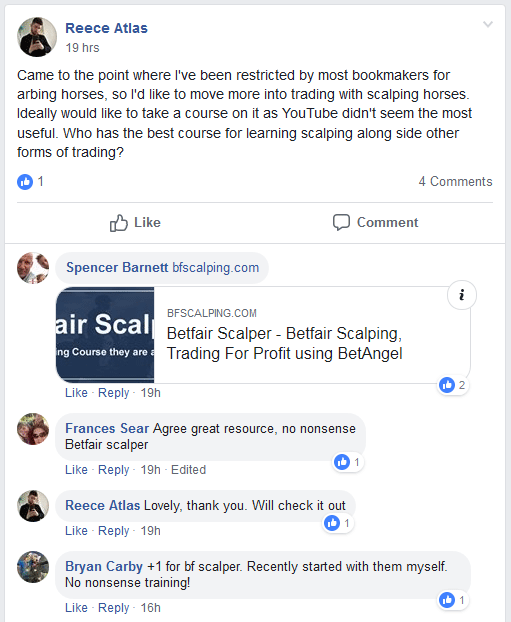 Questions and Answers about Betfair Scalper - You ask, we answer. ​In this section we aim to answer any questions you may have regarding your decision to invest in the Betfair Trading Course. If you have any additional questions, then please don't hesitate to ask using the contact ​link at the top of the page. ​​Is the Betfair Trading Course ​still going strong into 2019? Absolutely, the course is going as strong as ever. ​As we enter into 2019 more members are joining now than ever before. In fact, if I check the video statistics right now for how many members have viewed the videos in the last 12 months, you will see that the course videos have been played ​​682,000 times, which when you break this down is ​almost 2,000 views each and every day for the last 12 months. 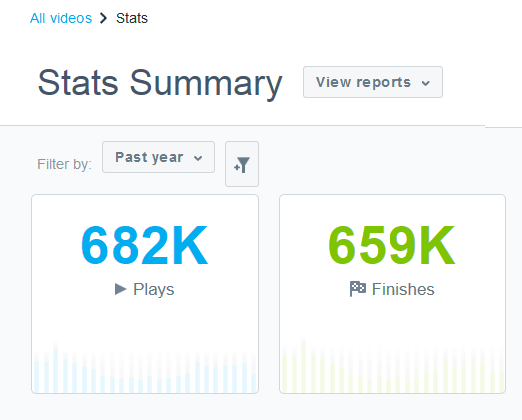 As you can see, that is a staggering amount of course video plays. And using the average video length on the course, that amount of 'plays' equates to our videos ​continuously playing, 24 hours a day for almost 8 years - and that's inside just the last 12 months of members playing our videos. ​So yes, the course is more active than ever before. We don't actually advertise the course ​directly, a​s most new members come from word of mouth; which means those already on the course are actively advising ​others to join. Just to give you an idea, at the time of writing this (late December 2018), here are just a few emails that have come in from members in the last week or so​. And the above emails are just from the last week alone. But, by all means ask them. If any other Betfair Trading Course vendor can show you similar emails from their last 2 weeks, we will give you access to 'our' course for free. That's how confident we are that what we offer is unique, and unrivalled. I'm sure you get the picture by now... although we could go on all night with similar references, and recommendations from actual members who are currently on the co​urse. So to answer the intial question again: Absolutely, the course content is just as relevant today, as the day we launched the course. Put bluntly: We don't play at this, we simply provide ​proven Betfair training that ​teaches you a skill, ​and that places our members in a position of making a consistent profit - which is the reason our course is easily the most talked about on the internet. ​Can anybody learn to trade Betfair, or is experience needed? If you have a desire to learn how to profit from Betfair, then you can - period. If you are preprared to put all the ​excuses to one side, then you can learn to trade, and make a profit from Betfair. This is exactly what we teach you on this course. Literally anybody who has the desire to learn trading can trade successfully. It is like learning any subject - it is a case of finding out what you need to know (via the course, and the markets) and then following through ​at your own pace, and progressively learning this skill. It does not matter if you have traded before or not, we all have to start somewhere​. The course materials will start at the very beginning​ and actually assumes that you have never traded before, and therefore you will be taken by the hand as a complete beginner. ​In fact, it actually helps if you don't have any experience trading, as that way you will not be carrying any negative baggage from failed teachings. The first advice we give you on the c​ourse, is to totally forget everything you 'think' you may know about trading on Betfair. ​​I work ​9-5 during the week, Can I still trade? ​Yes you can. Many of our members have jobs, and work 9-5. On the first question above you will have seen an email from a course member who works nights, and trades just one hour a day with a 95% success rate. You can learn from the course materials anytime you wish ​to, and in your free time. The beauty of trading in the UK, is that there is horse racing 7 days a week​; almost every day of the year, ​and you have weekends as well. - all giving ample opportunity to trade no matter what your working week. ​​Who is teaching the Betfair Trading Course? ​​​The whole course is created, and explained by a gentleman called Stuart, a professional Betfair trader who has been an advisor to our publishing company on trading products for well over 1​2 years. ​One of the leading Betfair traders in the world - ​Stuart also just so happens to have a 'knack' for teaching the subject to others, so that they can follow in his virtual footsteps. ​Having been involved in the gambling/trading industry for over 20+ years. Stuart is also a highly successful businessman who has turned over many millions of pounds in his own (now sold) companies; ​​semi-retired in his early 40's, and who now trades exclusively​. Stuart is highly respected by our members, and is well known for his direct, no-nonsense style; clear and detailed explanations; ​impeccable responses and support to all members - even at 2am ​on a Sunday morning, which surprises many, such is the passion he has for this subject. ​Full details of Stuart's fascinating sports trading journey is found in the members area, which shows exactly how he started in the industry. In fact, Stuart's personal story proved such an inspirational hit with readers, that many asked if it could be turned into a ​book for download, which is now provided in the members area. ​​​Do you have many full time traders as members? ​​​​This is another question we get asked a lot. We have had bus drivers giving up their ​jobs once they have learned the trading from the course. ​Members who are t​ravelling overseas​, and trading as their income, without travel restrictions. ​Many members who have gone full time after learning to trade​. ​Retirees who for the first time since retiring now making consistent profits. ​Ex-pats now using the co​urse as their sole source of income. Professional traders using the course content to add to their existing skills. Members with ​Dyslexia, Autism, Asperger's and other conditions making ​profits with the course. Overseas members making profits ​using the course as their sole source of income. Many members surprised at making profits using our course, after failing with other courses. ​Members who supplement their income in the evenings, or at weekends. We have hundreds of these type of comments in emails, and profit screenshots sent in from members who are now on the course. You can see approximately 100 of the​ emails right here. ​We receive such comments on an almost daily basis, and have done for the last 2 years. ​In fact, we have never, ever seen such comments regarding others courses, and their training; so we are very proud of the fact that the training we provide really does work. ​So to answer that question, yes, many members have gone full time, and are now using what they have learned from the course as their sole source of income. ​​Much of this you will see in the member feedback section located in the members area, as we use that section to show all members the possibilities, and what other members have achieved via the course teachings. ​There is a video at the end of this page which will show you a conversation with a member, an​ expat now living in Spain, who makes £100 a day after just 3 months on the course. ​Is there a PDF download, or is the course all video? ​​You cannot learn to trade from a book - period; and anybody that tries to tell you otherwise is trying to pull the wool over your eyes. When we were originally going to put this information together, it did start as a 50+ page PDF (as an experiment, and the intention was not for it to be made public​ at that stage), and we had a selection of beta testers ​test the information. It very quickly became apparent that you cannot replicate thoughts,​ reactions, and quick decision making from reading written text. ​When you are learning how to trade, it is of paramount importance that you get into the head of the trader teaching you; how he thinks; why he acts a certain way, and exactly why he is making certain decisions. This cannot be explained in text; but with video, you can see live, exactly what is happening whilst at the same time listening, in detail, to the thought processes of such decisions. When reading text, you are left to your own conclusions without the validation of listening and watching what is being explained. ​All the course material is in video format, with some explanation in text accompanying the video​s. All the content is located in ​a secure members area​. You can watch from anywhere in the world, and on any device. Once you have joined, you are immediately granted access to the full course content. All membership content is filmed is high quality HD, ​with clear, concise, and detailed explanations. ​Will this training course definitely work for me? How well you do with the course will depend on how much effort you are willing to put in. That is key, because in this crazy online world you will see many promises from many websites about how easy it is to make money - it isn't easy, understand that concept now, or you will forever be chasing something that does not exist. ​You only make it easy, when you apply the effort required - That is a universal principle that will never change. 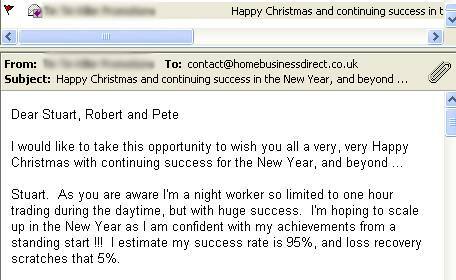 We could literally show you many hundreds of emails from members doing well with the course, and making profits. We receive such emails and profit screenshots on a daily basis. ​Your success depends on you. ​The skill we teach 100% works - it is what you do with that training that will decide your success. But you ​will need to learn this first. And with respect, this is not a game where you can passively make a profit without any effort - those kind of notions only work in ​fiction films, and in marketer's minds. ​Does more people trading limit my own success? ​Absolutely not, in fact the opposite is true. The more people who trade the Betfair Exchanges the more money that enters the markets that we can all take advantage from. For traders to be successful, there needs to be ​other people trading and placing trades into the market. On any given race there are literally thousands of different angles that a trader could enter into the market at, which means the chances of somebody else doing exactly the same as yourself, is slim to none, so more active traders will not affect your own success. The more people trading the better for all concerned, and the niche of sports trading is literally exploding at the moment. ​I have experience with matched betting, will this help? ​​We have a fair few members who have progressed from matched betting onto actual trading. ​Will it help? Being fairly familiar with how the exchanges work will help you somewhat, although the difference between matched betting and real Betfair trading is vast - with respect, a 5 year old could do matched betting and succeed! ​The advantage with trading though, is that when your bookmaker accounts are all banned, and restricted, trading on Betfair allows you the freedom to use this skill anytime you wish. ​And your bookmaker accounts will get banned at some stage with matched betting, that is a given. Bookmakers will not allow you to continue to milk them and abuse their offers for ​too long. ​With Betfair trading, you will ​be learning a progressive skill, and not just looking for arbs between the bookmaker and Betfair Exchange - there are no bookmakers involved with trading; and this is an advantage. ​Do I need a big betting bank to trade Betfair? ​​​No, this is a misconception made by many. ​You can start with any size of betting bank. ​Because we are trading before the race has even started, then you can actually predict the size of the betting bank you will need before you enter into a trade - based on the odds of the horse. ​Also, Betfair's minimum stake is just £2, so you can start to learn this skill with a minimal betting bank, and then increase your bank as you gain more experience. This is exactly how we advise to do this on the course. ​Why is Software needed to trade (Betangel)? ​​​The reason why successful traders use ​specific software, is because Betfair's own website is not set up for pre race trading (which is what we teach), and because it is far easier to use software to see exactly what is happening in the market. The software also has micro charts which are far more detailed than anything shown on Betfair's own website, and this, together with other features the software has, makes it far more profitable to trade using the software. ​The software is very easy to use, and is not in any way complicated. After a week or so, it will be second nature. To put this simply, it gives you far more control. ​Which version of Betangel do I need, as there are different versions? Betangel the Professional version is better, but we also tested the Trader version, which is a lot cheaper, and that would be fine for scalping and pre race trading also. Many members eventually move to the Pro version once they realise that what we teach really does work; but yes, the Trader version will work for scalping and pre race trading also. If you look on the Scalping content page (when you join), you will also see that there are 2 x detailed videos explaining how both versions of the software work, and that both versions can be used for scalping and trading the pre race markets. Both versions have a trial ​period, and you could upgrade at a later date. The software can be rented also. There are usually discount codes for the software if you search online. ​Just as a matter of interest, we have absolutely zero affiliation with Betangel, it's just the software we advise to use at this moment in time, and that the course material has been built around. ​​Do I have to trade on a Windows PC? What about Apple Mac? ​The software that we advise, Betangel, ideally has to be run on a Windows PC, because the software was made to run on a Windows computer/laptop. Please remember that this is a professional trading course, and you are looking at making an income from the teachings, therefore this needs to be taken serious, and with the right tools for the job at hand. This is the reason why we do not advise trading on tablets, or mobile phones, because you just won't get the detail, or speed required to be successful. 1) Using a VPS, which basically acts an an online server that the Betangel software is loaded on, and you then log into this server to trade. Betangel offer this, albeit it is a slightly expensive option. 2) You could set up your own VPS to install the Betangel software. ​3) You can use an emulator on your Apple Mac which will then 'act' like a Windows PC enabling you to install the software the same way you would a Windows computer, for example: Bootcamp Assistan​t is one of the most popular emulators. ​4) You could simply buy a cheap Windows PC/Laptop, the likes of which can be purchased on eBay for a very low cost these days, and then you can install the Betangel software without any problems. Option 3 & 4 are the most popular amongst members who ​own an Apple Mac. ​​​I already have alternative trading software, can I use that? ​​The whole course is created using Betangel which has features other software does not, like the inplay trader, etc. which creates the risk free element. We have had other members try using other software but have eventually gone back to using Betangel with much better results, because you cannot mirror what the course teaches without following the exact instructions using the software we use, which is Bet​angel. It could be possible to use other software, but without knowing exactly how that other software would react to markets, timings, features, etc. it is difficult to say with any accuracy. We certainly wouldn't want to put our name to such a possibility without testing it first. So yes, we would have say at this stage that you absolutely need Betangel to get the best out of this course, as some of the content may not translate very well without having that software. ​Trading, and successful trading is all about the detail, and no two software applications are the same. ​Certain other traders will push a software application because they get a 'kick back' from the vendor - we don't, the only reason we advise Betangel is because we have found it to be the best software for the job of making a profit from the Betfair markets. ​If you are not currently making trading work for you, then changing the software whilst learning what can, and does work, should be your first port of call. ​How long will it take before I am making a profit? Most members do start making profits within a couple of weeks, and then it is a case of gradually improving, and increasing those profits, which is how we teach it. ​Make no mistake, this is not any kind of silly get-rich-quick scheme, the likes of which you see branded around the internet on a daily basis. What we are teaching you in this course, are time tested methodologies that now very many members are using daily to make profits. ​Cutting corners is not an option - leave that to the dreamers of this world. You are learning a serious skill, and like any other skill worth learning​ - this will take time. We have had members who do fly out of the blocks and start making profits relatively quickly, although this will depend on your own learning style, and ​your perceptions of the Betfair marke​ts once you start trading. At this stage it is FAR more important to​ learn exactly how to use the markets to your advantage, than it is to start making early profits. ​We always advise that members take their time when learning to trade. It definitely helps them in the long term to absorb what they are learning. This is crucial to long-term success. It's like learning to drive; sure you can go on a fast track 7 day course, but would you be a better driver than somebody who has taken their time to learn to drive over a couple of months? Of course you wouldn't be as good, so as with the learning of any subject, it really depends on how you pick subjects up. ​Do I have to pay tax on any profits? ​​No, in the UK you do not pay tax on any income from ​'betting activities'. ​Why not? The government changed the rules ​many years ago and decided that no tax is to be paid from the customer of any betting ​arena. The reason for this, is that if HMRC made people declare their profits from such activities, then any losses people made could also be claimed back via their tax returns. ​HMRC would never open themselves up to such a possibility. Therefore any tax is paid by the betting company concerned, in this case, Betfair. ​I am retired now, is age a barrier, or am I too old? ​​We receive many questions like this, but the fact is we have MANY retirees as members, and whom do very well. At the time of writing the oldest member we have is 84 years of age, and loving the course based on the emails he has sent in. We also have members who have stated that for the first time since they retired, that they are now making consistent profits on top of their pensions. ​Only last week we had a 75 year old retired gentleman (John) emailing in to say that his first 2 live trading days were a 100% success - he made a profit on every single trade he entered into. There is a video of this in the members area. Age is not a barrier to success, which you already know. It is just a case of learning the course materials at your own pace. ​Why is your ​course better than others out there? 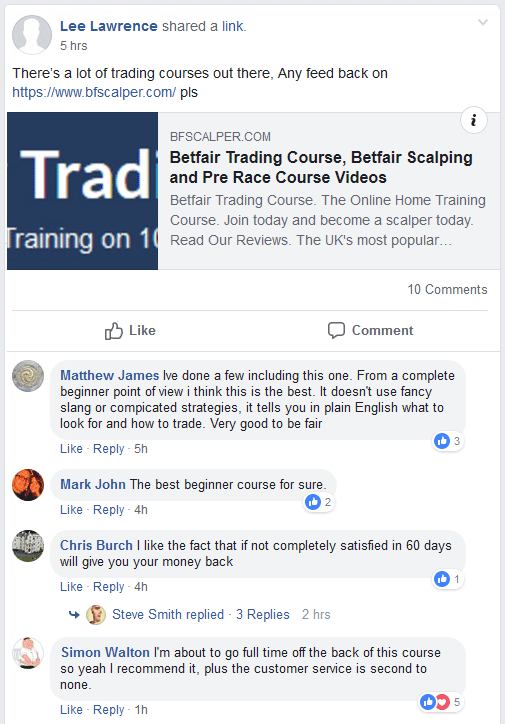 We are not really interested in what other Betfair trainers claim, we leave it up to our members to say what they think of our course, and the training we provide. ​​​​​Many members (as you will see on the feedback page, together with the Member Feedback section on the course ​once you join) say that our course is the best Betfair training course made available anywhere on the interne​t f​or the last 20 years. Very many say that our teaching style is unique, and that the detail explained on the videos is unrivalled by anybody else, as we are sure you will see once you join the course. Unlike some other traders, and their courses, we show you EXACTLY what to do to make a profit, using endless amounts of live trades that we slow down to show you 'the thinking, and reasoning' behind every decision made. This is very important, as there is literally no point just watching videos of profits being made without the 'ingredients' ​contained in the decision making. We also offer a complete 60 day money back guarantee, in that if after 60 days you have not made a profit, or can see value in the course, you can ask for your money back. No other Betfair trading course vendor offers a similar guarantee - such is the confidence we have in our product. ​Refund rates on our course are ​virtually ​non-existent​; in fact for transparency, and although we have thousands of members, only 0.6% of members have ever asked for a refund - almost zero - which is unheard of in this industry. ​Do we believe our course is the best available on the subject of Betfair trading? Yes - by far. In fact recently, a 'trader' who had been selling gambling and trading products for many years purchased our own course, and tried to copy it word for word and sell it as his own - until our solicitors got involved, that is. ​Also, ​certain course vendors who were around before we created our own course, are now placing much more effort into their latest content, and changing the theme based around how we teach​​. They can change content all ​they like, but it is the teaching that matters, which is where our recommendations come from. ​Wayne Rooney may be able to score a 'screamer' from 30 yards out, but if he cannot 'teach' you how he does that, in detail, and with precise explanations of his thinking; ​actions, and the exact 'ingredients' he uses when making decisions, then there would be no point in him becoming a football trainer. ​This is where we are very different. We offer a proven training course, and by somebody ​who just knows how to teach the subject you are looking to make financial gains from. ​Please do not underestimate that distinction between the 'online salesman', and the practised teacher - life is too short to buy into hype. ​​​How many of your members stick with the course? Once you see the membership content, together with the training, ​ you will immediately see why our course is the most talked about on the internet - with literally thousands of members. We launched the course back in ​the latter months of 2016, which has been constantly updated since (at no extra cost) and we are proud of the fact that 99% of all registered members are still on the course today. ​As you can quickly see, most members who joined the course way back in 2016 are still logging in today - 2 years later. The reasons for this will quickly become evident once you log into the course and see the training materials, together with the results and feedback from other members on the course. ​How much money can I make, seriously? ​This is probably the question we get asked the most, and depending on the theme of the email, will depend on how we reply to such a request. The reason being, that trading takes effort, time, and commitment; it is not the case of passively 'watching a few videos and then making profits a day later'. ​Why not? Because 'real' trading is about learning a progressive skill, an accumulation of different skill sets that leads to the position of being able to extract a profit from the Betfair markets at will. Therefore, if we feel a member would potentially not have the aptitude for trading (or who has been conditioned by silly marketing tactics), we will decline the membership. But, the majority of our members really do appreciate that effort is required, because although we can teach you this skill, you will have to take action to practice, and spend the time in the markets to test what works for you personally, as we are all different. 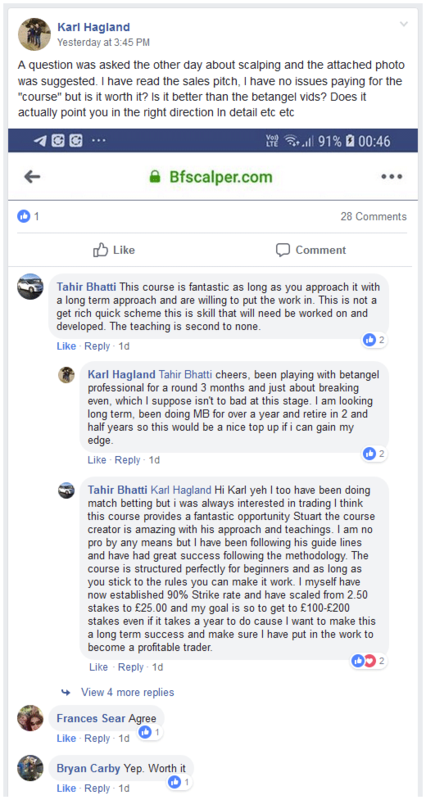 Just to give you an example, I will show you a video of a member discussing how he got on with the course very recently (at the time of writing), and how long it took him to gain the level of income he is now making as a result of the course. ​The member on the video below is now ​disappointed if he is not making £100 a day, such is the habit he has generated of making such an income using the skill taught in our course.